For $753, you can get a sleek, shiny compact electric range from Summit. 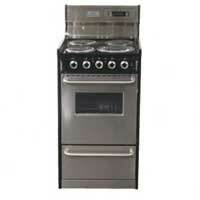 Its heating, baking, and broiling functions are quite satisfactory, and the four coil elements lift up for cleaning. An ample storage drawer gives you even more kitchen space by keeping all your cookware out of sight but close at hand. The backguard adds a nice touch to the model’s design and includes a digital clock. The oven capacity is also spacious given the range’s compact size. Overall, we were pleased with this model’s performance and elegant look.